Washington (CNN) -- The Transportation Security Administration extended through at least Wednesday heightened security measures in the aftermath of a failed attempt to blow up a U.S. jetliner, the agency said. The security directive to airlines and airports was set to expire Tuesday night, but the TSA extended the directive as it sought to further refine it, officials said. 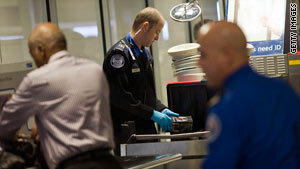 A new directive will be issued by Wednesday night, the TSA said. One TSA official told CNN that any changes are likely to be minor, but that discussions are ongoing. The current directive requires airlines to pat down all passengers boarding planes bound for the United States and inspect their carry-on bags. Do new rules make you feel safer? Share your airport experience. It also gives airlines the discretion to take other measures to prevent people from secretly assembling or igniting bombs on aircraft. Those measures include prohibiting people from keeping pillows or blankets on their laps during the final hour of flight. The added security measures were implemented after 23-year-old Umar Farouk AbdulMutallab tried to set off a bomb aboard a Northwest Airlines flight from Amsterdam, Netherlands, to Detroit, Michigan, on Christmas. How will international travelers be affected by terror alert?